Pastor Noel began with VCI in Edmonton at Fort Road Victory Church in 1995. He began serving in various leadership roles in 1998, beginning on the worship team. His ministry experience includes Worship Pastor, Youth Pastor, Victory Worship Arts Steering committee, Church Board of Directors/Treasurer, assisting with Worship Arts program at VBCI, as well as leading worship at Various Victory Conferences in different countries, including Men's Conference, World Conference, Nationals, Fire Conferences, Worship Conferences, etc. He has been involved in the recording and production of 3 VWA Worship Albums and has been a workshop speaker for various conferences and has been a part of FRVC leadership in multiple capacities for several years. 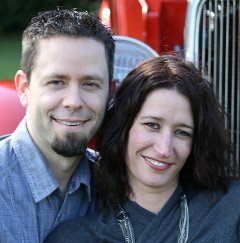 Pastor Noel has strong administrative skills gained, not only in the church, but through 14 years in a successful family Hot Rod business. He also holds a degree in Mechanical Engineering Technology from the Northern Alberta Institue of Technology. His experience has also given him the ability to connect with people of all ages. In his spare time, he enjoys building old cars, hockey, playing music, and spending time with his family. He is family focused with his wife of 15 yrs, and 3 beautiful daughters, and has a heart after God with a vision to express His love to the world. Carolyn began with VCI in the same church as Pastor Noel in 1996. Shes has been a leader in Children's Ministry since 1998, as well as Worship Ministry, Youth Ministry, Womens Minstry, FRVC Leadership, and part of the steering committee for the True Beauty Girls conferences and Victory Worship Arts. In her spare time, Carolyn enjoys shopping, reading, fellowshipping, and spending time with her family. She too has a heart for the family, young girls and to see people of all ages reach the full potential God has for each of them.